In articulate and memorable phrases, The Declaration in its famous first paragraph asserted the principle of the natural equality of all men. Then it listed grievance after grievance against the King and by implication the British Parliament. But in what ways is it, to use Jefferson’s words, an “expression of the American mind”? The Declaration would let the world be the judge of the colonies’ decision to throw off the British government and institute their own. The document is, in another important sense, a petition. In this way, the Declaration was an appeal to mankind, similar in form to previous listings of limits on the King’s power stretching as far back as the Magna Carta (1215), the Petition of Right (1628), and the English Bill of Rights (1689). It differed fundamentally from these, in its recognition of the people as sovereign, and in addressing “mankind” instead of the King of Great Britain. When [the colonies were] forced ... to resort to arms for redress, an appeal to the tribunal of the world was deemed proper for our justification. ... Not to find out new principles, or new arguments, never before thought of, not merely to say things which had never been said before; but to place before mankind the common sense of the subject, in terms so plain and firm as to command their assent, and to justify ourselves in the independent stand we are compelled to take. Neither aiming at originality of principle or sentiment, nor yet copied from any particular and previous writing, it was intended to be an expression of the American mind, and to give to that expression the proper tone and spirit called for by the occasion (Thomas Jefferson to Henry Lee, May 8, 1825). Most of all, the Declaration reveals the influence of English philosopher John Locke. In his Two Treatises of Civil Government (1689), Locke set forth a theory of natural rights starting from what he called the “state of nature.” In this imagined or primitive condition, there was no government and all men (including women) were equal. Because all men were equal, each would have an equal right to govern, and confusion or anarchy would result. Then in order to have a government, a majority of individuals would have to consent to a government that would rule over all, instead of each person governing for himself. In this consent, each person exchanges his natural right to govern for a civil right to live under constitutional government. Why would anyone make this exchange? It is reasonable when a government of laws gives all citizens greater security in their rights. Security includes life, liberty and property, for in the state of nature one’s life, liberty and property are very insecure. It makes sense to have a contract—and Locke’s theory is often called a “social contract” theory—in which each person agrees to a government that protects everyone’s rights. The rules of the social contract that Locke lays down are called “Laws of Nature” because they describe how human beings would act in accordance with their equal nature, no one of them being entitled to rule others without their consent. With their human nature, humans are also said by Locke to be the “workmanship” of God, made by God with natural rights. Human beings are made by God with the power to govern themselves. So the Declaration speaks of “the laws of Nature and of Nature’s God,” referring to the harmony of God’s Nature and human rights. The Declaration also reveals the influence of Locke’s arguments in favor of religious “toleration.” Toleration means the absence of persecution from government. It is important to emphasize that the “intolerance” of Locke’s age was not what we might think of today. Today the word “intolerance” is often used to describe speech or practices that some find offensive. For example, the CEO of a famous company states his personal views on a controversial social issue. Or a college student tweets an observation using ugly, racist language. “Intolerance” rarely refers to official government policies that discriminate against religious minorities. It never refers to rulers burning people at the stake. But that was exactly the kind of the “intolerance” in the recent memory of Locke’s time. Locke concluded that the people have a right to establish a government to secure their rights, as well as resist one that fails to do so. This right is repeated in the language of the Declaration, as the “right to alter or to abolish” a form of government that destroys the people’s rights. In 1685, Locke was in exile in Holland, a Calvinist theocracy. There he saw French refugees escaping persecution, as Louis XIV had recently revoked laws protecting the Huguenots (Calvinist Protestants). He wrote “A Letter Concerning Toleration” not only in response to his time but as a statement of general principles regarding religious liberty. While arguing that Christian sects had much in common, he asserted that no just government could compel belief or worship: “The care of souls is not committed to the civil magistrate, any more than to other men.” he wrote. No government could force people to practice a religion. “[F]aith is not faith, without believing” (John Locke, “A Letter Concerning Toleration,” 1689). Locke’s ideas were too revolutionary for England, even once the Anglican Church was firmly established after the “Glorious Revolution” of 1689. Catholics were denied full rights of citizenship. The principle of toleration was established even though the full practice of it was not. 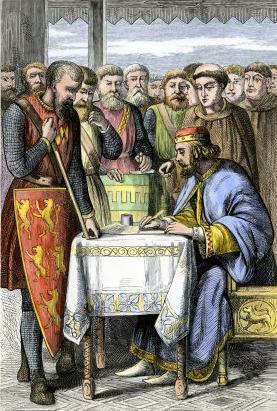 Further, parliament declared that no Catholic could ever rule England again. In what would become the United States, the fuller expression of Locke’s ideas about natural rights and religious freedom began to take hold. The colonies won their independence and, later, became the United States. While almost all colonies and, later, states, had official churches, most had disestablished by the late eighteenth century and done away with punishments like public whipping for blasphemy. The U.S. Constitution (1789) would ban religious tests for federal office, and the First Amendment (1791) would ban Congress from establishing a religion or prohibiting free religious exercise. One thing that makes a person and person (and not one of the animals which people can naturally rule) is his conscience. The equality principle, based on human nature, demands that no just government can persecute and oppress religious minorities. “It is now no more that toleration is spoken of as if it were the indulgence of one class of people that another enjoyed the exercise of their inherent natural rights, for, happily, the Government of the United States, which gives to bigotry no sanction, to persecution no assistance, requires only that they who live under its protection should demean themselves as good citizens in giving it on all occasions their effectual support” (George Washington, “Letter to the Hebrew Nation in Newport, Rhode Island,” August 18, 1790). Locke’s philosophies and writings were part of the “American Mind” and our tradition of rights because they provided foundations for the principles of equality and religious freedom. As the author of our doctrine of individual rights, Locke remains today the founding philosopher of American politics.